It is increasingly important for businesses to practice sustainability in today’s world. The planet is filled with materials that are used once and left out to decompose for centuries. You can play an important part in keeping the earth clean by operating a business that has good sustainability practices. Here are four tips that can help business owners think green. There are many companies that supply the market with environmentally friendly products. For example, BionicYarn.com supplies textiles that have been made from discarded plastic in the ocean. By purchasing this textile, you will help get rid of the plastic that is currently causing ecological damage and prevent new plastic from entering the market. Recycled material has a quality that is comparable to non-recycled products and can also help to improve a company’s image. By sharing that your company utilizes these materials to keep the environment safe, more people will want to support your endeavors. It will show you are a responsible business and value protecting the environment. It may seem like a small detail to keep in mind, but will play a big role in keeping unnecessary waste out of the landfills. If some non-recycled material must be purchased, it is important to recycle it when you are through using it. You can put this into effect by making recycling easy to accomplish in the workplace. Place recycling bins near trash cans, and make sure that they are cleaned out when they get filled up. Not only can you make money from recycling, but you will be encouraging your employees to take up this responsible habit for themselves. Many non-profit organizations rely on donations to operate. By supporting them financially and giving them exposure on social media, your business will be doing wonders for the sustainability movement. Your donation doesn’t have to be a lot, for every dollar helps keep the environment clean. You can even consider volunteering for nonprofit organizations in your area with your employees. There are always plenty of opportunities for picking up liter or encouraging recycling in your city. 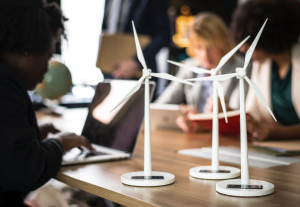 Although your company must operate to generate revenue, many companies try their best to leave a positive environmental footprint. You can assist the sustainability movement by doing business with these companies. Partnerships and exclusive contracts can form as a result; you can form a network of businesses working together for the sake of the environment. By assisting those who are already carrying out sustainable practices, your efforts might lead other companies to go green as well.